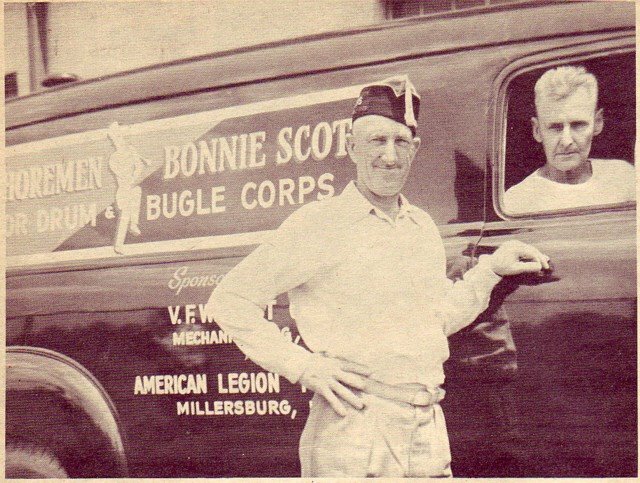 Benny Behrens, truckdriver and quartermaster for Westshoremen-Bonnie Scots, is pictured standing by their new truck. His helper, Levi, is looking out of the window. If Benny looks familiar, it is because he has been the corps' truck driver for almost 10 years. Before that he was a bugler with Aurand Post Corps in Harrisburg. As late as 1960, Benny was active in Westshoremen color guard. During the week he is kept busy at Penna. Power and Light. Fortunately his job permits him to be free for evening parades and practices and of course, the important week-end contests. It's impossible to figure how many miles that Benny has traveled in the Westshoremen truck but the most memorable trip was to Miami in 1957 where the corps placed third. Benny left Harrisburg on a Friday morning, picked up their new uniforms and plumes in Philadelphia, then headed to Miami and a VFW National contest. What is there to do when the corps does not have a contest that particular week-end? Benny has the prfect answer! It's simply - - join all the other spectators at a contest. I remember Ben Sr. he still drove the truck into the early sixtys. When I got married we unloaded the (new) walk-in, powder blue corps truck, moved my stuff from my apartment to a new house. Took the truck back to Ben's farm (with animals)loaded the corps equipment into it and headed for the corps first show in Mount Carmel sponsored by the Mounties. This was May 29th,1965.